One of the most stunning places to take pictures in the GTA is a Knox College in the U of T campus. 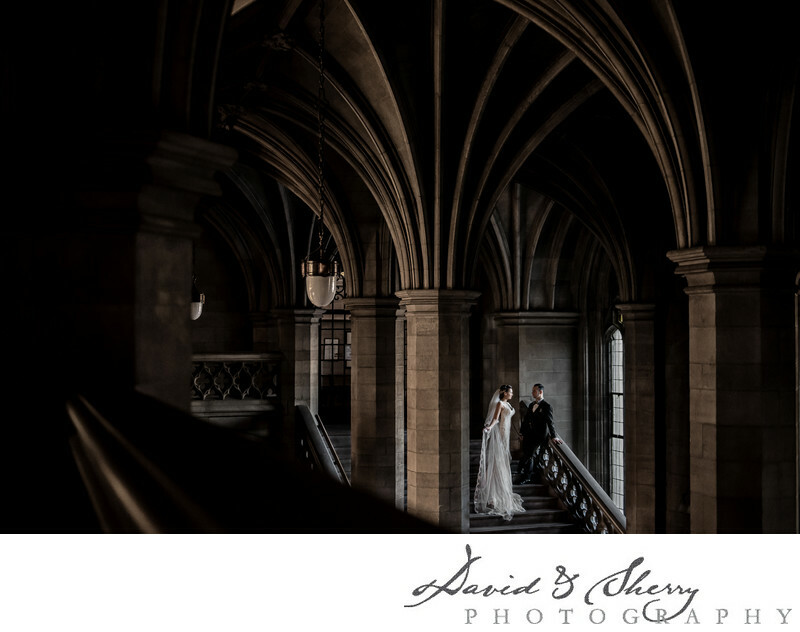 It is a very popular location to take pictures in because of it's neo gothic architecture and the fact that it is over 100 years old. The stone staircases and castle like feel is not available anywhere else in Canada. These wedding photos have a style of grace, elegance, timelessness and culture that will make them some of the best wedding photos in Toronto for many years to come. I love how the bride and groom standing on the staircase, one backed against a dark background with light on her face and one on a light background with shadow on his face. The play with lighting is wonderful and I love the composition of this photo. Permits are required for taking pics here but it has so much to offer both inside and out. Hart House is another of the many locations at the University of Toronto that is available for taking pictures. It boasts grander spaces and a spire inside one of the Libraries which reaches up to the second floor. It looks like something straight out of Harry Potter and Hogwarts. The courtyard at Hart House always has perfect lighting because there is beautiful architecture every direction you turn so no matter where the light is coming from you can use it to your advantage. I love looking for the rim lighting given by a late afternoon sun in this courtyard as I think that is the best time of day for capturing romance in my camera. This large open area can be perfect for large group shots as the University College building stands at the end of this park like space. There are often people eating their lunch on this portion of the campus and though you don't want to take too much time here it is great if you have a lovely sky or some beautiful clouds to take pictures of with your couple. The library at Trinity college was the location of one of my favourite bridal party photos. Inside the great hall there is a head table that we re-created a last supper style group photo which won a wonderful award. Wedding photos here are only allowed for alumni and those with the proper permits but a number of times we have had the privilege of shooting here. I always bring a couple of flashes along as sometimes it can be rather dark in these old buildings. Most of these buildings have a wonderful history to them and can compliment your wedding photos, especially those found in your finished album.